﻿ Why is India developing its maiden deep-sea port in Indonesia. Why is India developing its maiden deep-sea port in Indonesia. India is developing its maiden deep-sea port in Indonesia's Sabang, not far from the Andaman and Nicobar Islands, amid China's attempts to have a greater say in the region through the Belt and Road Initiative (BRI). The port will be key to India's Indo-Pacific strategy. 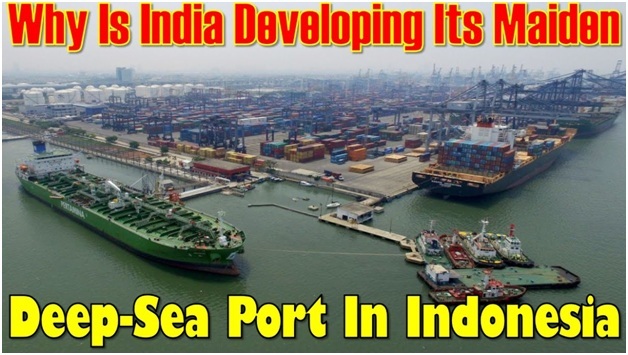 The port will give India better access to the South East Asian markets and provide a strategic hedge at a time China is increasing its presence in the Strait of Malacca (as also the larger Indian Ocean). Despite the Look East Policy, tracing back to the days of then PM Narasimha Rao, India's relationship with ASEAN nations have largely been trade-oriented. But the rise of China in the waters of Indo-Pacific (and its economic clout) calls for a new approach to the region. Hence, the reason the Narendra Modi government has upgraded its policy to Act East. But countering China in the region is easier said than done. For one, China is the largest trade partner to ASEAN, increasing from $192 billion in 2008 to $515 billion by 2018. Then there is the BRI, through which China has spent about $400 billion. Also, China's focus on Indo-Pacific region is aimed at displacing the US from the region — American military bases in Guam, Diego Garcia (Indian Ocean) as well as in Darwin (Australia), and its economic ties with the region ensure its primacy. But that mission threatens India as well, considering the nature of the relationship between Beijing and New Delhi. Hence, strategic partnerships with Indo-Pacific nations help. During PM Modi's visit to Indonesia last year, the two nations had agreed on a "Shared vision of maritime co-operation in the Indo-Pacific". Connectivity with Sabang port was identified as a key priority area within that vision. Following this, an Indian naval ship, INS Sumitra, visited Sabang for the first time last July. Now an Indian Coast Guard ship, Vijit, has visited the port (from March 17-20).